My mother grew up in Ipil Zamboanga del Sur and became wary of Moslems for being violent, ill-educated and always out to make a quick buck at the expense of others. Naturally, that was how I saw Moslems too, until I met Wanie in law school, one of the kindest, smartest and most generous persons I’ll ever have the privilege of knowing. And she happens to be Moslem. Obviously I realized that Wanie wasn’t one of “those” Moslems that my mother feared, and that for every one of her, there were hundreds and thousands more just like her who were far from the stereotype that had been fed to us for far too long. I was clearly the ignorant one for thinking that ALL Moslems were to be feared just because my mother’s experience with a handful had not been positive. 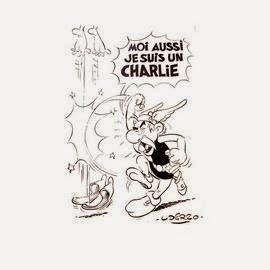 While it was great that the Asterix cartoonist came out of retirement to show his support to the murdered Charlie Hebdo journalists, I fear that although well-meaning, his cartoon will only further stoke the anti-Islamic fire that is already threatening to engulf us. Please take the time to read this wonderful article over at Raptitude (What Terrorists Want From You). I will always admire all the good that religion has and will bring to humanity, but maybe John Lennon had it right all along and we’d be better off without religion. If we considered ourselves as human beings first with our religious and political affiliations only secondary, all of our perceived differences will dissipate. And with all the differences wiped out, we’ll see ourselves in everyone around us, thus making them human too in our eyes. Mam Jill, thanks for writing this post. My boyfriend is a muslim too & he is from Tacurong, Sultan Kudarat. I was hesitant to tell my mother where my boyfriend is from until my brother who works in mapping went there confirms that place & the people there are good. What amazes me about my boyfriend is his family – his mother is a muslim while his father is a catholic. Some of her sisters are muslims while some are catholic and he chooses to be a muslim (masyado raw kasi maluwag sa katoliko parang hindi seryoso ang tao pag nagsisimba). We sometimes talk about our beliefs because I justify my religion being a Catholic & when arguments started we stop. I listen to what he shares about his religion while he listen too with some good points that a catholic have.
" Respect is really important to every religion as belief is important to every individual because it composes the wholeness of a person." Thanks again mam jill for sharing your insights here. i may know your friend wanie, we're from the same institute for our bs degrees. she's a really nice gal. I read the article you shared and I think I have to agree with points raised by the author. It's unfair to generalize. Not all Muslims are bad. I remember I once wrote a paper in college about fundamentalism. I found out through research that among the many Muslim groups, most are peace-loving and only a handful are radicals. I grew up in a Muslim area. I was even ambushed and hit by M16 in our area but I don't have any grudges against Muslims. Here in UAE, we are exposed to many nationalities and many of them are Muslims. I actually realized and experienced in many occasions that real Muslims have a kind heart, they value family and clean heart, and they have really other good qualities that stemmed out in beliefs their as Muslims. It's good that your perception changed.